A few years ago urban farming in developed cities was a fringe topic that few designers or architects thought much about. There were exceptions: we tried hard [but failed] to build a prototype of Natalie Jeremijenko's Urban Space Station at Designs of the time in 2007. But the prevailing design view until recently was that food growing belonged as ar away from the city as possible. Now, as the realization dawns that global food systems are neither resilient nor sustainable, small-scale urban plots are sprouting up everywhere - 2,000 new projects in London alone, by some accounts. 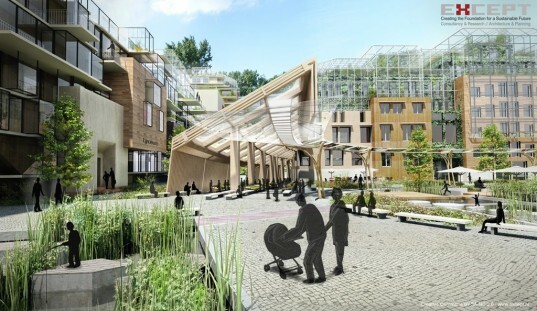 In their wake a new phenomenon is evident: design-led proposals to optimise urban food production that combine elements of permaculture, technology, and a whole-systems approach. One such project, proposed by Except Integrated Sustainability, is called Polydome. It offers, say its designers, "a revolutionary approach to greenhouse agriculture with the possibility of commercial scale, net-zero-impact food production" . Intrigued by the bold claims made for the project, I talked in Amsterdam with one of Except's partners, Eva Gladek, to find out more. JT: So tell me about Polydome. EG: Polydome is a concept for a new kind of polyculture greenhouse that achieves very high yields by strategically interweaving crops and livestock. With its diverse outputs (over 50 crops, two mushroom varieties, chickens, eggs, fish, and honey), even a small Polydome system can provide a richly varied food supply for a large population. We calculate that with the yields and diverse outputs shown in our model, Polydomes could allow most western cities to produce most of their own food within city borders. JT: It sounds like a Dutch version of Xanadu - marvelous, but mythical. Does Polydome have roots in the Dutch context as it is now? EG: We developed the concept partly in response to needs of some of earlier projects. Last year, for example, we developed a neighborhood concept for renovating a social housing area in Rotterdam's Schiebroek-Zuid neighbourhood. 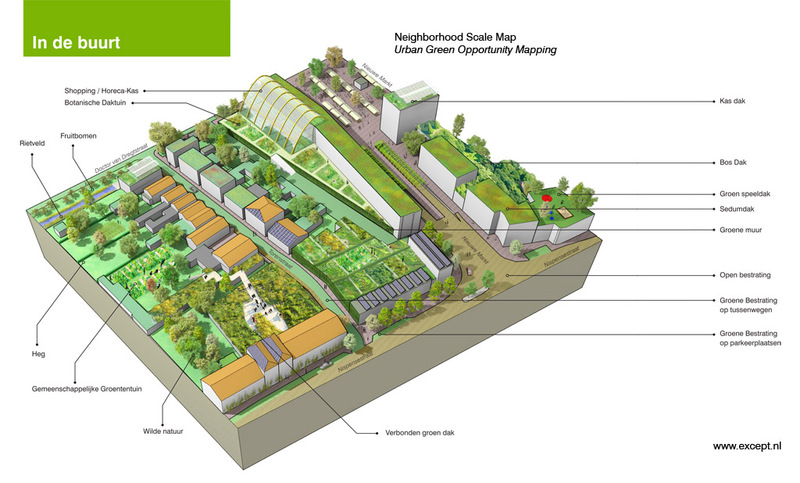 We recommended a lot of urban agriculture, both for its socio-economic benefits as well as to serve as a kind of 'metabolic engine' for the neighborhood by generating energy and locally handling green wastes and gray water. To make this metabolic engine large enough, we also wanted to introduce commercial-scale agriculture in local greenhouses. These greenhouses would also serve to capture a lot of the heat necessary for residential space heating and hot water in the neighborhood. JT: If I fly over The Netherlands today, I see mile after mile of glass houses already. What's different about your's? EG: Currently all commercial greenhouses in the Netherlands are geared to produce a single crop. There's no way a small, local population will need for 33 tonnes of tomatoes; they'd all end up being funneled into the global produce distribution chain. This which would create expense in both economic and environmental terms. This approach also fails to provide the diverse local food supply we'd ideally like to see. The technologies for greenhouse monoculture are extremely well-developed, but there's very little information out there on producing multiple crops within a greenhouse. JT: Don't many indviduals already grow multiple crops in greenhouses? EG: One of the practical motivations for the project is to find an agricultural model that would be useful for urban environments, produce a variety of edible products, and allow for more than hobby-scale urban agriculture. JT: I guess it's true that whole populations cannot be fed by each individual growing her own food - but does the scale have to be so much bigger than that? EG: A deep motivation for this project is to explore what truly sustainable agriculture could look like. Agricultural activities currently occupy around 40 percent of the terrestrial surface of the planet and already take up most arable land. And yet our demand for food is steadily growing as global population increases. This is a real confounding problem for humanity. Our contribution to thinking about solutions to this existential challenge is to focus on greenhouses. JT: You say that 'for the first time in history, cities could become producers rather than just consumers'. How would this happen? EG: We believe that there are many reasons to bring food production into cities: increasing people's connectivity to the food chain, improving food security, helping close nutrient cycles, reducing food miles, etc. Despite this being an active field of interest and discussion, there is still widespread skepticism about urban agriculture actually possible on a serious scale. Based on the calculations we've done for Polydome, even if we were off by a factor of ten, it is clear that commercial-scale urban agriculture is feasible, even economically speaking. And Polydome is only one of several approaches that could work. What we're missing is the investment, political support, and the urban farmers who are willing to take this task on. Knowledge and social barriers have become more of an issue than technology at this point. JT: But you're not claiming that Polydomes can feed the world? EG: For the record, we don't think that all food should necessarily be produced within cities. Not everything can be grown in a Polydome, for example – grains, large trees, etc. A lot of the culture around food and where it is produced will also hinge on how people's diets evolve. Grains and cattle remain the largest drain of land and resources; this is something we honestly need to evaluate as we set goals for sustainable food production in the future. EG: One reason is that they can offer 10 – 20 times more productivity per square meter than field agriculture. That's an enormous benefit when we're talking about limited land resources and concentrated populations of consumers. JT: You promise that the goal of Polydome is 'net zero impact'. What do you mean by those words? EG: In simplest terms, it means that the food produced in a Polydome greenhouse would ideally leave the production facility with an environmental footprint of at least: zero greenhouse gas emissions, zero waste, zero synthetic chemical use, zero non-renewable water use, zero soil erosion. These are some of the major impacts that the world is most concerned with in terms of agricultural production. It's currently impossible to buy food that doesn't have at least some significant impact in one of these categories, if not in all of them. JT: This is where my gut instinct tells me that that you are being over-optimistic. EG: I think it's natural to be skeptical upon hearing this. After all, everything we do these days has an impact. My response to that is to think of a forest. Forests are teeming with growth, and produce a large variety of biomass faster than any of our commercial farms. And yet, they do this successfully without being fertilized, sprayed with pesticides, or causing a significant net impact in any of the categories I just listed. That is proof that such a thing is possible. JT: But Polydome is not a forest, it's a man-made machine - or sounds like one. EG: Biological systems adapt intelligently to surrounding environments and do enormous amounts of work using only ambient climactic conditions and renewable resources. So the idea behind Polydome is just that: design a kind of agriculture where biological systems do most of the “thinking” and the work. We will certainly need supplemental energy for some mechanical equipment, ventilation, and lighting – that is where we can rely on technology. JT: The words 'rely on technology' make me nervous. 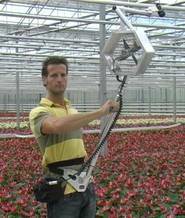 EG: The number and sophistication of greenhouse innovations developed in the Netherlands is astounding. The country already has a nation-wide goal of achieving zero-energy greenhouse production within the next 10 years. So our objective for Polydome is to combine the best of both worlds: biological and technological, relying on technology only when necessary. JT: What kind of inputs would the system need to achieve those 'high yields' - for example, energy, water, or chemicals? EG: Right now, Polydome is a concept rather than a specific design. All the data we've gathered are the basis of our blueprint for making the system net-zero impact according to the definition I described. We're not starting from scratch here: we understand how the different parts of the system interact on a material and energy level. However, Polydome will need to be be customized to fit the context of its actual environment, so the greenhouse will have different product combinations and physical structure depending on where it is located. JT: Where does the energy come from to make the whole thing run? EG: We did a lot of research on energy technologies for greenhouses. We put together a portfolio of options for making the system carbon-neutral. We also did a lot of research on integrated pest management strategies. Companies like Koppert Biological Systems who we talked to, specialize in biological crop protection and natural pollination. They use biological systems to protect crops using minimum chemical corrections. [The photo, below, is a hand-held device that sprays 'good' predators over a crop where they will eat the bad ones]. Koppert maintain large databases on companion planting, for example. Polydome uses this information to work without synthetic chemicals. [In many ornamental and tree nursery crops, the use of biological pest control can be time-consuming. Koppert's Airbug hand-held blower distributes predatory mites quickly and evenly. The company claims this delivers savings in labour of around 80% compared with manual introduction. JT: I'm still not convinced that a man-made machine of the kind I am hearing you describe can be closed-loop. EG: Because it is a polyculture, it is also quite easy to make the system closed-loop in terms of nutrients by changing the ratios of certain elements in the system. If there is enough land to pasture cattle in the area, then all you need is a small number of cows per hectare of greenhouse to close the nutrient cycle. Alternatively, if you actually place the greenhouse in an urban environment, then you have various options for getting return organic wastes from residential or commercial operations nearby. EG: The biggest challenge is indeed to provide enough water using local, renewable sources. 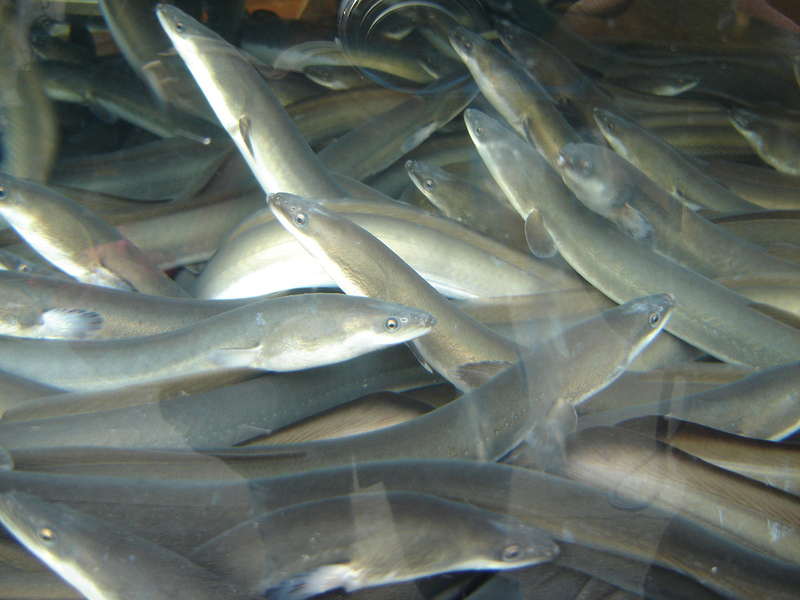 Some of the water in Polydome is cycled through the aquaponics system [see the edible eels, below] multiple times, but there are also soil-based crops, which use much more water. In the case of trees, this can partially be addressed by planting them very deep in the soil, reducing their dependency on irrigation. Though this wasn't so much of a problem for our model, which used Dutch rainfall values, we expect it could be more difficult to secure in areas with less plentiful water resources. In an urban environments, water supplies could be easier to secure if the Polydome could use filtered gray water from neighboring residences and commercial areas. JT Polydome still sounds like an industrialized farm, only under glass. What's the difference? EG I guess that really depends on your understanding of the word 'industrialized'. It's certainly intended to function, at least potentially, as a commercial farm, and it could even be designed to be quite large. Polydome doesn't strike me as industrialized, though, because for me that word smacks of a high degree of mechanization, precision, straight lines, etc. Because it's a polyculture, Polydome can never have the degree of mechanization that most industrial farms currently do. The crop clusters within the system result in a lot of intercropping, with nectarine trees, for example, planted together with garlic and artichokes. Each plant type has its own maintenance and harvesting schedule. This should produce the visual effect and feeling of an intensely designed garden rather than an industrial farm. JT: That might be the visual effect, but surely the people in the picture are still tending a machine? EG: The patterns of labor in the greenhouse also demand more flexibility and creativity than the labour required by existing industrial agriculture. The people working there will need to use their perception and intelligence to ensure that the plants and animals are doing well. I must say, though, that I don't object to industry per se. I object to the reductionist logic prevalent in industry – the decisions to ignore the complexities and benefits of biological interactions, the insistence on synthesizing everything and on keeping everything uniform and commodifiable. Those aspects of industrialism are certainly absent from Polydome. JT: Polydome makes me think of earlier closed-system experiments such as Biosphere 2. That experiment seems to have failed because it was not a natural system. It was set up by humans, rather than evolve over millennia. What's the difference between Polydome and a a Biosphere? EG: Polydome would never be a closed system in the sense of Biosphere 2. Depending on the specific energy and ventilation technologies that we select for the particular design, the greenhouse will have exchanges of soil, air, water, insects, or even animals with the outside world. We want Polydome to be 'closed' in its cycling of nutrients and materials. This means that whatever nutrients are extracted from the soil or water in the system should be returned, preventing a state of constant depletion. In parallel, the system should be zero-waste. The point of Biosphere 2 was quite different; it was to see if humans could create eco-capsules that would allow us to survive in outer space – or on Earth in case things on our own planet went horribly wrong. And in fact, if I recall correctly from a conversation I had as a child with one of the original crew members of Biosphere 2, their system didn't fail on an ecological level nearly as significantly as it did on a human level; the second mission was abandoned after the crew got into a series of dramatic arguments of some kind. So thankfully Polydome won't be housing any humans! JT: The idea that humans and ecologies are in different categories begs a multitude of questions. EG: Well, technically speaking, all ecosystems are productive in the sense that they take carbon dioxide and water, and turn it into large quantities of biomass. As humans, we're particularly interested in certain types of this biomass, ones that can be classified as food, fiber, or 'useful' chemicals such as medicines or fragrances. I don't think we're trying to say that the ecosystems are aspiring to do or be anything in particular - they just happen to be usefully productive from our point of view. JT: Has all this come out your head, or have you done research to back up the scenario? within the greenhouse were designed taking into account all of these interacting variables. We also interviewed many companies working in the greenhouse sector– from research groups working on sensor technologies to greenhouse designers to actual growers. We learned a lot about the latest technological advances that could play a role in truly eco-efficient greenhouses. EG: One example is the Daylight system developed by Technokas. EG: Well, yes. 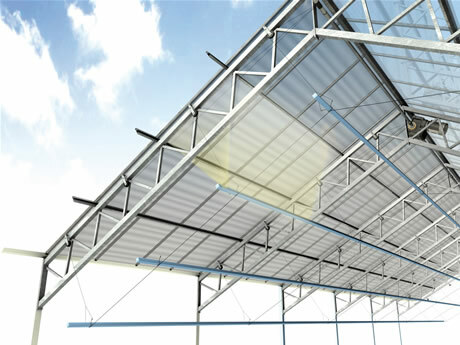 The system uses fresnel lenses embedded in the greenhouse roof glass to focus direct sunlight on thin strips of PV cells. The PV cells generate electricity and hot water (through water piping that is used to keep them cool) all without preventing plant growth in the greenhouse below. This is unique. It allows a single vertical area to be used for many different purposes. It is these multi-solution innovations that I find most promising. JT Your visiting card says 'industrial ecologist'. What does one of those do? EG Industrial ecology is sometimes it's referred to as the 'science of sustainability'; it's also been described as the study and optimization of material and energy flows within society'. Industrial ecology is a new interdisciplinary science that melds social and technical knowledge, and focuses on systems thinking. JT Except's materials cycles charts are beautiful to behold. Are they based on real numbers? EG Why, thank you. Yes – they're all based on real numbers. And they're quite fun to draw. JT: You're also a blacksmith? 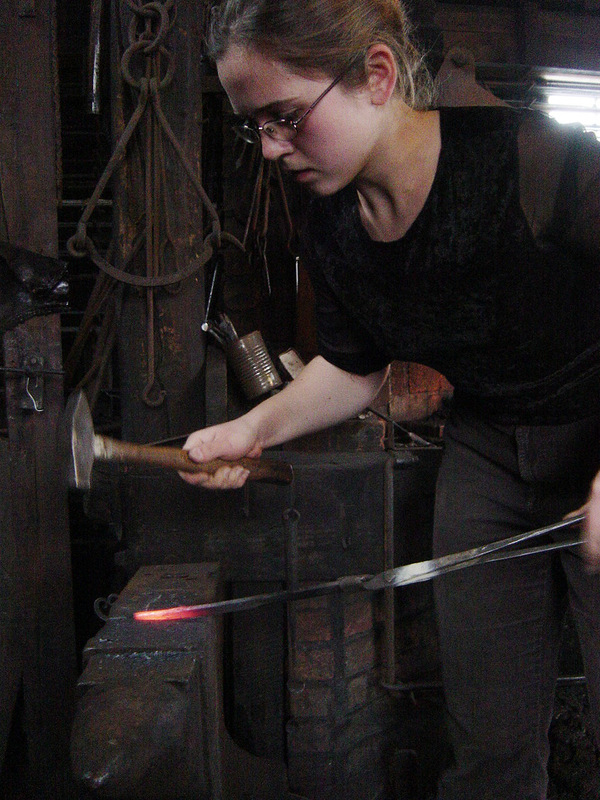 EG: I spent two years blacksmithing quite actively. but for a few years now I've only had intermittent access to a forge, since I've mostly been living in the center of cities. JT- Who will work in Polydome? EG: Polydome could lead to the emergence of an entirely new kind of farmer, a new professional niche for educated urbanites who are looking for 'real'work rather than the abstract, mostly computer-based labor that is currently the primary option for urban professionals. Operating such a greenhouse will require ingenuity, business sense, and an understanding of living creatures. Of course, it will also require some physical labor. But in contrast to existing agricultural systems, this labour will vary on almost a daily basis, and rarely include single stretches of the same repetitive task. JT: When I went to live in the Netherlands in 1993, everyone was complaining that glasshouse-grown tomatoes were tasteless. Won't Polydome produce be tasteless too? EG: The popular mythology around the weak taste of Dutch greenhouse tomatoes is that it results from two things: harvesting while the fruits are still green and the fact that the tomatoes are grown hydroponically without soil. One producer told me that harvesting before the fruits ripened did indeed have a small impact on taste but that the main issue is that the market isn't willing to pay for better-tasting tomatoes. The varieties grown now are easy to grow, get large quickly, don't spoil as readily, etc. Better-tasting ones are apparently more finicky. Do eco learning journeys need a travel agent?